Traditional Indian dress for men varies widely according to region. People in the North of the country in Punjab and across the border in Pakistan traditionally wear the shalwar kameez although dhotis are also popular in villages. Dhotis are also popular in villages in Southern India and are even worn in the cities specially when not at work. Sherwanis, heavy buttoned up knee-length coats, are worn over kurta pajama or shalwar kameez suits as a formal dress in Uttar Pradesh and in Pakistan. We shall look at some of these more popular male Indian costumes in this article. In the big cities such as Delhi, Calcutta, and Bombay, the pre-eminent dress for the Indian male is the shirt and trouser suit. Indian shirts usually have loud motifs, broad collars and are generally tight-fitting. These go with tight trousers that are usually an earth-tone and oxfords or other dress shoes. Businessmen generally prefer two-piece European style suit-and-ties or safari shirt-and-trouser ensembles. These are almost always worn with oxfords. Men who work in the streets may prefer chappals for their footgear which are sandals ranging in style from the ubiquitous Hawaiian to garish plastic affairs to more traditional black leather strap sandals. It is also not unusual to see laborers and rickshaw drivers wearing sleeveless or half-sleeved vests with their tight ill-fitting trousers and chappals. The dhoti is very popular in South India and is worn with sandals and vests when off work from the office. Called a veshti in Tamil, this is just a long length of loose cloth expertly tied at the midriff. This may or may not be worn over boxers or briefs. In the south, the dhoti may be worn with a short shirt or unstitsched cloth draped over the shoulders – younger Indian males also wear it with t-shirts or the loud large-print button-up shirts popular in the country. In North India, this costume is normally outfitted with a much looser shirt called a kurta which usually hangs thigh-length or lower. This is popular in the villages and is worn by some city dwellers as a light airy costume for when relaxing at home in the hot summers. Another close cousin of the dhoti is the lungi which is worn in various forms in Bangladesh, Burma, and Southeast Asia. This is made from a much shorter length of fabric than the dhoti and may be stitched in front. South Indian lungis are generally more colorful and available in elaborate designs. Kurtas and Kameezes are full-sleeved shirts. 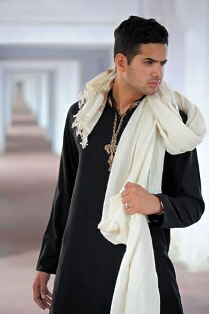 A kurta is generally slightly tighter-fitting but is still a very comfortable piece of apparel. Kurtas generally do not have collars or they may have band-style collars and they do not have cuffs. A kameez is baggier, has a collar, front pockets, proper cuffing, and a shalwar kameez suit is generally more popular with males in Pakistan. The full-length pajama is also tighter than the baggier but other wise similar shalwar and both are tied with a cord at the waist. Kurtas may also be worn with dhotis and are preferred wear under a sherwani.